Ask your doctor, chiropractor, or dentist if your condition is one that might benefit from hypnosis. 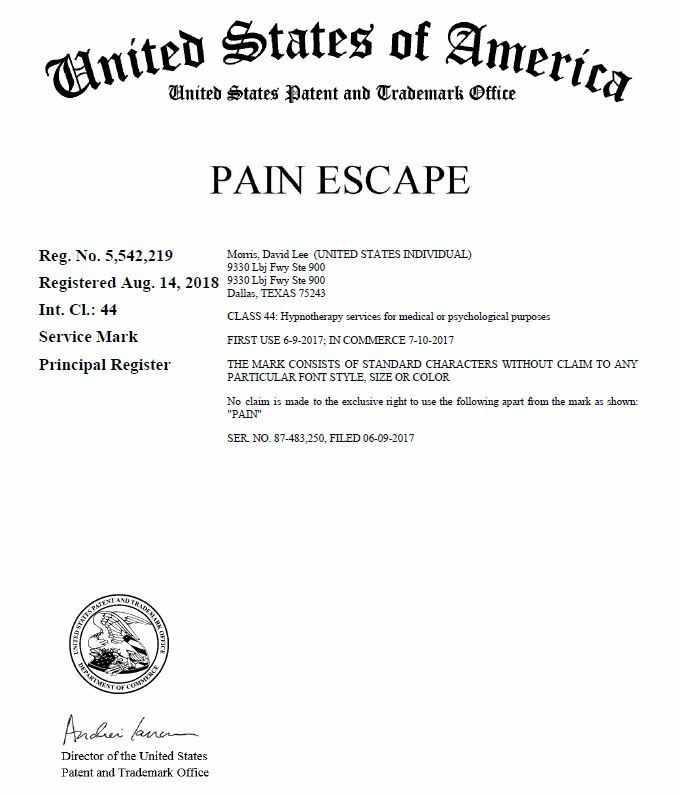 Why not ask for a referral to your nearest Pain Escape® office! An important aspect of hypnosis is that it turns off the "critical faculty", allowing suggestions to reach the subconscious mind. While we may not know the exact mechanism for this, fMRI research shows that our subconscious mind controls our actions and decision-making well in advance of any conscious, logical thought processes. And thus, anything we can do to influence the outcome of subconscious decisions will have a powerful effect on behavior. 2Is it possible that I cannot be hypnotized? According to some researchers, about 10% of the population cannot be hypnotized. However, the very nature of scientific research requires all hypnotic inductions used in the experiments be performed identically. And that fails to account for the fact that we are all "wired" differently. Your Pain Escape Hypnotist can adjust the hypnosis session to accomodate almost anyone's requirements for obtaining the desired hypnotic state. It is very rare for a Pain Escape Hypnotist to be unable to achieve the desired state. 3What is it like to be in a hypnotic trance? The closest thing to being in a hypnotic trance is probably watching a movie in the theater. You are relaxed and become absorbed in the film and tune out everything around you, in order to "experience" the movie fully. You are not asleep or unconscious! 4How does hypnosis relieve pain? For some, pain relief comes as a form of numbness in which you have no sensation of pain at all. For others, hypnosis simply allows the mind to no longer care about the sensations coming from the source of pain. Either way, hypnotherapy can relieve your suffering. 5Can you guarantee success in pain relief? Just as your physician or dentist cannot guarantee outcomes, neither can we. Every person is wired differently. We will publish percentages of success on our web site, but let's say we have an 80% success rate with some particular procedure. Do you know if you are in that 80% group or not? Your Pain Escape Hypnotist is trained in a wide variety of different protocols for obtaining relief from suffering, and we will zero in on those that offer you the best results! 6How many sessions will it take? It may sound like a copout to say it all depends on how your mind works with your body. But everyone benefits from the very first session, and we will publish the average number of sessions across the Pain Escape Network. Some are able to re-wire their brain in a few sessions. Some take a few months. We urge you not to think of hypnotism as a magical way to switch pain off in a single session. But everyone realizes a benefit, and you will learn in our sessions how to give yourself more and more relief over time. 7What if I want help with smoking, anxiety, weight loss, etc? Pain Escape® offices are focused on chronic pain and the alleviation of anxiety some may have before a surgical or dental procedure. However, some of our Pain Escape Hypnotists also have additional training and Advanced Certifications to provide general hypnosis services of all kinds. Check the Office Locator to see if your preferred office has Advanced Certifications. 1Is Hypnosis the same as Mind Control? Not if it implies that the hypnotist controls your mind. You control your own mind. The hypnotist will lead you in a process that gives you more control over your own mind, to help change the way your mind processes pain, anxiety, and other conditions you want to treat. 2Will I divulge all my secrets? No. Your Pain Escape Hypnotist is only interested in the things in your mind that improve your health, reduce anxiety, and relieve your pain. If there are things in your past that might be causing your problems, talk to your hypnotist about them, and discuss whether it might be useful to explore those memories. 3Is it possible to get stuck in a trance? No. The hypnotic state is similar to daydreaming or "zoning out". You've probably done that a thousand times, right? And you never got "stuck". 4Can a hypnotist make me do something I don't want to do? No. In hypnosis, you won't do anything you do not want to do. You would open your eyes and look at the hypnotist and object to anything that violates your conscience. 5Are there any negative side-effects? No. Experts all agree that hypnotism is one of the safest methods of treatment, with no after-effects except maybe a profound sense of relaxation and peace of mind. 6Are you going to make me bark like a dog or cluck like a chicken? No. That's what you see in stage hypnotism shows. We have no use for dogs barking or chickens clucking in our office. But the same mental dynamics that allow someone on stage to not be aware they are barking or clucking is also effective in helping you not be aware you have pain! 7Will I remember what happened while I was in trance? Yes. The hypnotic state is akin to daydreaming. You are not asleep. You won't have amnesia. You will hear everything said, and you can choose to remember everything you want to remember. 1 If you are experiencing a new pain, you should always see a doctor, chiropractor, or dentist, and get a referral before seeing us, because this is a cry for help from the painful part of your body. However, if your doctor has already done as much as s/he can and you are still in pain months later (i.e. chronic), medical research shows hypnosis can help reduce your suffering. If you are not currently being treated by a healthcare provider for the condition, we will decide during your initial visit whether we can proceed without a referral. 2 Requires Advanced Certification. Offices staffed by hypnotists with Advanced Certifications are shown in the Office Locator table and are identified at the top of the Local Office's information page.